The community of Sölden in the Tyrolean Ötztal Valley is not particularly exciting - as mass tourism due to skiing has altered its general appearance for the worse. However, it is a highly popular destination just because of the skiing opportunities in the surroundings mountains. The hotels of Sölden offer an unbelievable 15,000 beds and sell more than two million B&B arrangements a year. This makes this unassuming village one of the most touristy towns in all of Austria. The hotels of the village match the common stereotypes: pseudo-alpine and tourist friendly. It is hard to imagine that these buildings cover something that has a genuine history. Mountain cabins in the inner part of the Ötztal were used in Neolithic days: Hunters and shepherds had shelters here, at least during the summers. The most impressive testimonial of this time is Ötzi, the glacier mummy, in the UK also known as "Frozen Fritz". 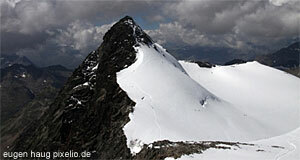 He was found not too far from Sölden, after being covered in glacial ice for some 5,300 years. The first shepherds have already arrived 6,500 years ago and pushed the forests back with fire to increase the meadow area for their cattle. The early settlers of the Ötztal came from the south - which continued to be the case for centuries. After the Neolithic settlers, it was Celts and Romans that populated the area. Many town names in the Tyrolean Alps are of Latin origin and there are various terms in the dialect of the inner Ötztal that are derived from Latin words. "Sölden" is based on "selda", which means "little farm settlement" and which can be tracked back to 1150. The following centuries were dull and un-happening, like in most agricultural villages in the Alps. Only with the rise of the skiing tourism, Sölden became an economic centre. Summer tourists started to flock into the village in the mid-19th century. Skiing, however, kicked in after 1948, when the first ski lifts were built. I was surprised to find out that the mass tourism in skiing did not really reach its peak until well into the 1970ies. Until then, summer (hiking) tourists were as important as the winter (skiing) ones. Since then, the focus has clearly shifted to the winter season. Joint with the skiing areas of Obergurgl and Vent, Sölden offers some 70 lifts, almost 200 kilometres of slopes, numerous huts and other ingredients for a decent winter holiday, such as saunas, pools, bars, skating and cross-country skiing facilities. Hiking tourists can exploit some 300 kilometres of paths, various huts that are open during the summer season, facilities for rock climbing and swimming as well as mountain biking. Verdict: Sölden is a great place for activities of the sportive kind and an anything-but-great-place for sightseeing and alike.